When I was asked if I Dare To Bare, the answer was definitely yes! I literally have not worn tights at all during autumn and winter, mostly because I'm either in trousers at work, high waist jeans or leggings at the weekend, or out on the town! I'm not sure what it is but I just haven't wanted to wear any skirts or dresses in the daytime apart from skorts. We all know of these shorts-skirt hybrids right? Well they are the perfect early evening outfit where you know you will be indoors, but you could wear cut-out boots or ankle strap heels. I received a #PerfectPins party pack from Sunkissed with this majorly cute skort from Bank, which I had to team with an off-shoulder neckline for a Clueless vibe. Damn I wish I had a choker! No bare legs are ready without a little preparation, and nothing feels as good as a sunkissed glow. Not too baked and bronzed - just a hint of colour to warm up in these chilly months. The party pack held a few golden tips I will definitely continue to use in the future. 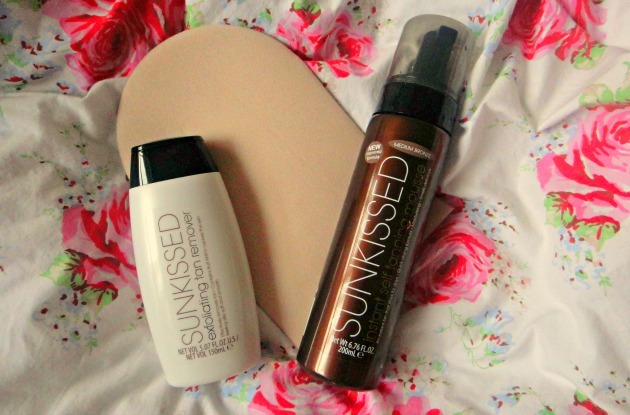 I'm used to tanning mousse but I haven't used Sunkissed before, so I would pick it up again if I wanted a warm tint. The key is to lightly gloss the tan over your skin so it just catches a hint of the product, rather than rubbing it in like a foundation. It should just sit on top of your skin, and always do ankles and knees last with the left-over product still on the mitt, moisturising them first. Less is more! Then use the mitt to dust over your skin lightly. The Sunkissed exfoliator is awesome too as it meets the level of grit you want without being scratchy. I find finer beads exfoliate much better than large chunks of sugar or salt in the mixture. Now that I don't really wear my own clothes to work, I let me tan fade during the week and reapply on Fridays, ready for weekend activities. Hello to the weekend! We are in 2014! I hope your year has started very well. I'm still not on 2014-time yet as it doesn't feel like I have fully returned to work or anything around me seems to have changed, but I know where I want to go this year. I just need to get there! One step was bringing a few fresh things into my daily mix, having spent almost the entirety of 2013 exercising a very modest approach to shopping. I have never used up so many things and therefore each new purchase has never felt so important. I had some Christmas money to spend and I already knew exactly what I wanted! I have never spent anything substantial on a bronzer or contour powder as I usually invest more in 'special' makeup, rather than things I use every day. That might not make total sense, but the makeup I wear to work isn't something that excites me. 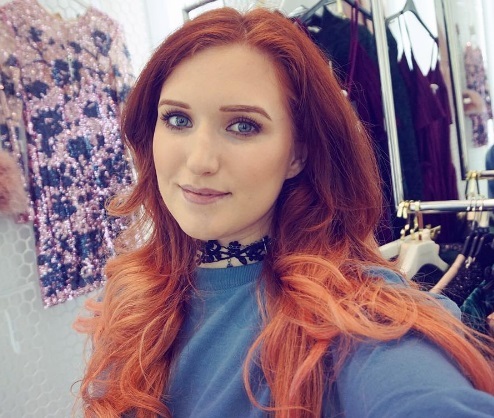 It's a mix of not wanting to spend lots of time on an average, daily face, and not wanting to use up any favourite products. However I tend to vary in skin tone across the week depending if I have tanned at the weekend, and needed a mid-tone bronzer that was buildable. 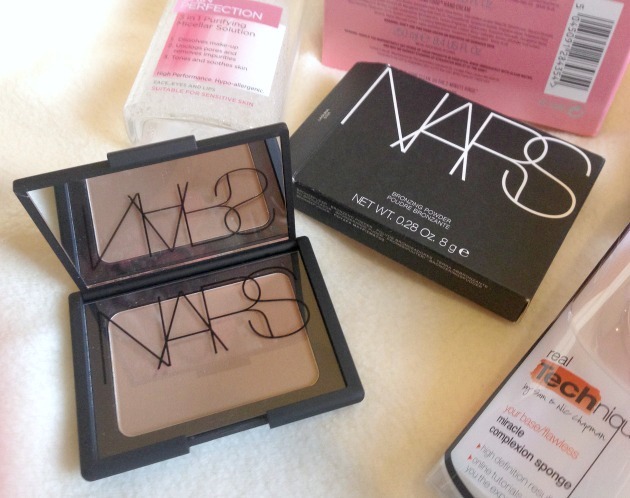 I have the Bourjois chocolate bronzer and an ELF dupe, but it was time to invest in the bronzer of legends: Nars Laguna. When I spoke to the makeup artist at the counter, I questioned whether it was right for my skin and she suggested it may seem to light but it would suit fine. I was actually wondering if it would be too dark, so that really pushed me towards the purchase and I definitely now feel the lustrous benefits of using a luxury product every day. As it is so fine and the palette is so generous, it feels like I am barely applying a dusting of this to my cheekbones and temples, yet the colour is definite and flawless. 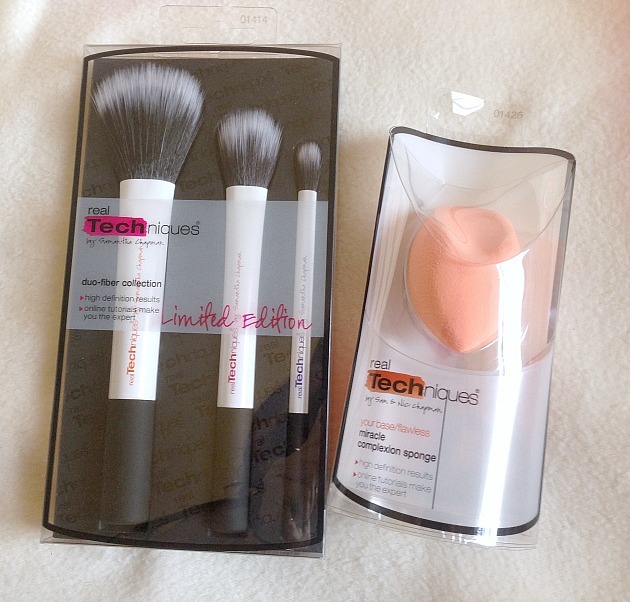 This is certainly enhanced by my brush haul of the Real Techniques duo-fibre collection. I have been considering new brushes for a long time and wasn't too set on another Real Techniques offering. Despite so many bloggers waxing lyrically for these, I found my blush brush felt spikey and rough over time, and my stippling brush never got clean enough to replenish the fluffy texture. I was looking to MAC and Sigma for their duo-fibre brushes as I much prefer a lighter application of heavier foundations, rather than very liquid formulas, but this limited-edition Real Techniques set seemed to offer everything I was looking for. I'm going to make sure I clean the brushes after every single use, and at Boots I also got the Miracle Complexion Sponge for half price in a deal. My ancient Beauty Blender sponge developed teeny tears which over time turned into larger rips, and it ended up totally unusable. I love a sponge foundation application (haha) even more than a brush finish, but I feel the coverage is not enough to stand my 9-5 days at work. My plan is to use the sponge when I have extra time to smooth over my skin and blend my final foundation/concealer/contour mix seamlessly. 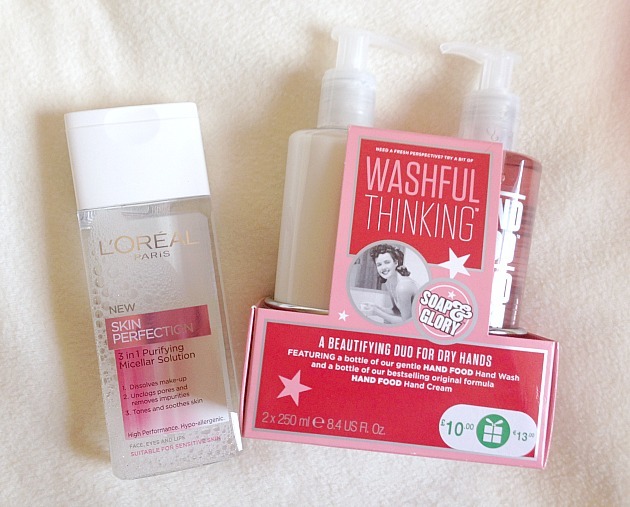 A few honourable mentions are the L'Oreal Micellar Solution, which seemed a bargain price to take place of my finished B. Pure Micellar Water from Superdrug. It might seem a surprise I'm not calling out the infamous Bioderma version, but I did not find any benefits to it at all. As the first micellar water I tried, the B. version left my skin tingling and literally breathing a fresh sigh or relief from any impurities, whereas the Bioderma and L'Oreal versions line up with no special effects. 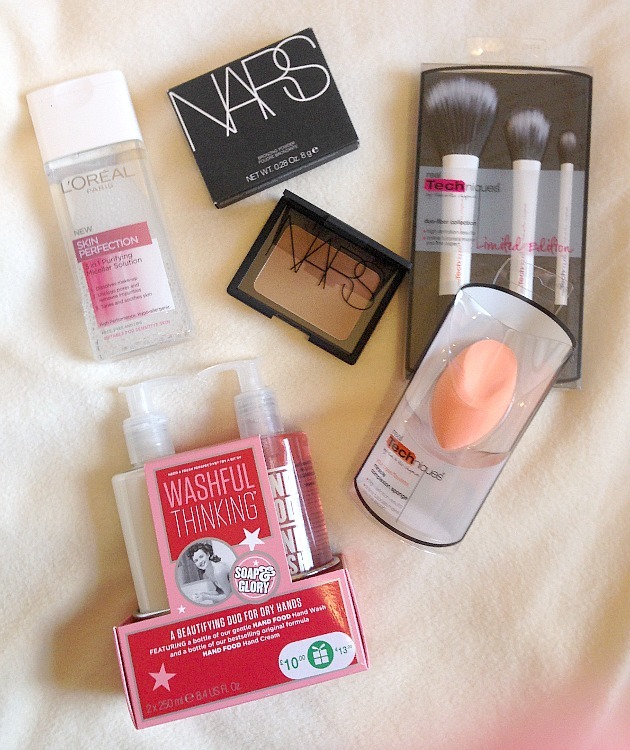 As soon as I use up this buy, I will be returning to Superdrug for the B. range. As for the Soap & Glory set, it was a bargain £5 deal in the Boots sale, but I was again slightly disappointed that the scent of Hand Food wasn't as incredibly delightful as the rumours say. I love a hand cream with a pump though. Pumps are so underrated!